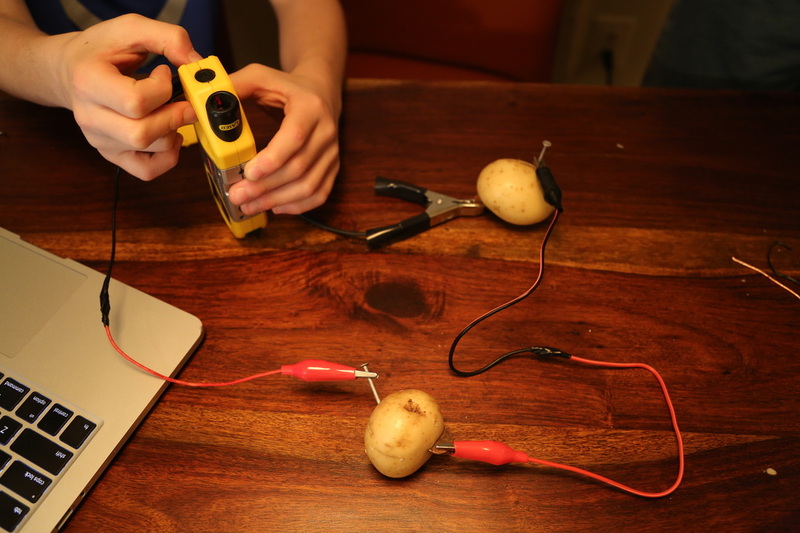 Question: Can a potato conduct electricity? Hypothesis: I think that the liquid in a potato can transfer the electrical energy generated by the copper strip and the zinc strip and will power a small LED clock. Find a partner. Each of you should have a potato. One person label the potatoes #1 and the other person label theirs #2. Attach the white connection wire to a copper strip by threading it through the small hole at the top and twisting the wires. Attach the other end of the white wire to the copper strip in the same manner. Next, connect the black (negative) wire from the clock to the zinc strip. Then connect the red (positive) wire from the clock to the copper strip. Poke the zinc strip attached to the black wire into potato #2. Poke the zinc strip attached to the white wire into potato #1. Do not let the metal strips touch each other once they are inserted into the potatoes. Poke the copper strip attached to the white wire into potato #2. The clock should turn on! A potato battery converts chemical energy into electric energy by electron transfer. The zinc in the strip reacts with the copper strip. The potato actually acts as a buffer between the zinc ions and the copper ions. We were wrong about this part of our hypothesis. We thought that the juice in the potato would conduct the electrical energy and allow the ions to come together. It actually keeps them apart, forcing the electrical energy to go up the wires and into the clock. If the zinc and copper ions were allowed to touch, they would generate heat but the potato keeps them apart. Instead the electron transfer has to take place in the wires, which channels the energy into the clock. I am 11 years old. I love lacrosse, football and snowboarding. I have one brother and two sisters. My favorite subject is Math and I love Science! I am 10 years old. I love football, ice cream, and snowboarding. My favorite subject is math. I like to ride my bike and play outside. We both love sports and science. We each have one brother that goes to SMS and we play on the same football and lacrosse teams. We both wonder how many potatoes it would take to power the scoreboard at the Somers High School turf field. When the circuit is complete between the clock and the two potatoes, it will run a small single battery (1.5 volt) clock because it can create electrical energy. Within the potato, chemical energy from the zinc and copper strips is converted into electrical energy. The electrical energy is forced up the wires and into the clock causing it to turn on. Two potatoes are needed to create enough electricity to power the clock. The clock continued to run for about 4 days using only potato power, then the clock started to loose time. By day 5, the clock completely shut off. So our hypotheses was correct because we got the clock to turn on, but we were incorrect about how it was working. 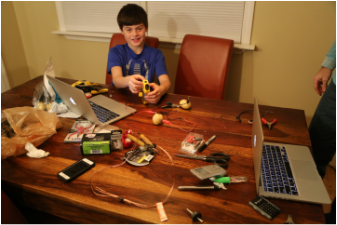 We experimented with a 12 volt light, a 12 volt buzzer, a 1.8 volt LED light and a single battery 1.5 volt digital clock to see which ones the potatoes could power. There is not enough electricity generated by the potatoes to turn on an L.E.D. light, or ring a buzzer because they require a higher voltage. We could not get any of the lights or buzzers to work, but the clock did turn on. We also experimented with a lemon and dark soda to see if they could power the clock. When a lemon was cut in half and used in place of the potatoes, it could also turn the clock on. Finally, we used two cups of dark soda instead of potatoes and they also worked!